PAF Open � the most exciting sports event in the Nordic region! The Swatch FIVB World Tour and all the world�s beach volleyball stars will converge on Finland and Sweden for the PAF Open, which is hosted by the city of Mariehamn on the �land Islands. It is the first time that two national federations have joined forces to stage a World Tour event and it is the first time such an event is hosted in Finland. �land is a beautiful archipelago which has about 25,000 permanent residents but every year attracts more than 2 million visitors. It is the perfect spot in many ways but for beach volleyball one of the greatest advantages will be that �land has the most sunshine hours in the entire Nordic region. The aim of PAF Open is to contribute to the development of beach volleyball in Finland and Sweden, and both volleyball associations have therefore seen �land, in the middle of the Baltic Sea and the Nordic countries, as the perfect spot. �The PAF Open is the biggest thing to happen in beach volleyball at our latitude. 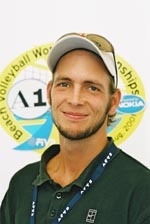 During my years on the World Tour, I�ve seen with my own eyes the importance for the development of the sport to have a World Tour event on your home ground,� says two-time Olympian Simon Dahl, Tournament Director of PAF Open. By investing in PAF Open, �land�s gaming company, PAF, will create a world-class event in an Olympic sport that benefits the whole of the �land tourist business and also the development of the sport on �land and in the Nordic countries. If you like world-class beach volleyball, excitement, laughter, dancing and cheering, �land is the place to be between 14th to 19th of August. Welcome to the PAF Open!